These are the major species datasets that we hold. We also have a few records of other things so please ask if you are interested in something you don't see. We are continuously receiving more data, so this metadata may slightly lag behind what we currently hold. Where appropriate, selected datasets have been uploaded to the NBN Atlas. (Click here to see our NBN Atlas datasets). Uploads to the Gateway only occur periodically and public viewing resolution is also usually restricted (as agreed with our data suppliers) so always come direct to the BRMC for searches of the most up-to-date data at full resolution. Our datasets, including those not available via the NBN Atlas, are summarized below. A mixture of casual field observations and systematic surveys. The records were provided by the Bedfordshire Reptiles and Amphibians Group (BRAG), Bedfordshire Natural History Society (BNHS) members, other members of the public and professional surveyors. Records were collated by the BNHS County Recorder for Reptiles and Amphibians. Uneven coverage of Bedfordshire and Luton largely as a result of casual recording, with some observer preference for location. Areas of the county remain unrecorded. 6030 records have a 100m or finer grid reference; 492 are 1km; 173 are 2km, 1 is 10km. Records cover the period 1973 to 2017, although not all years are present. Many have full dates (DD/MM/YYYY) but some are only summaries of years for particular sites. Observations were verified by the County Recorder. Unintentional inaccuracies may be present, though none are currently known. Approx. 6,685 records are held. 13 species are included. The dataset contains three types of record; systematic recording and monitoring of setts by the Bedfordshire Badger Network (BBN); Road Traffic Accidents; and general observations of badger activity such as latrines, prints and sightings of animals. Records were mostly provided by members of the public and by naturalists, many of whom are members of the Bedfordshire Natural History Society (BNHS) to which the BBN is affiliated. Records were collated by the BNHS County Recorders for Mammals and the Bedfordshire Badger Network. Approx 3,048 records are held. Records cover the period 1979 to 2015, though not all of 2015's records have been received yet. There are 6 older sett records with unknown dates which have been entered as 1900 to be clearly distinct. 98% of records have full dates (DD/MM/YYYY), 1% are month-accurate (MM/YYYY), 1% are year-accurate (YYYY). Geographical coverage is for most of Bedfordshire. 92% of records have a 100m or smaller grid reference; 4% are 1km; 4% are 2km. Three records are 10km. Observations were verified by successive County Recorders for Mammals. Unintentional inaccuracies may be present, though none are currently known. This dataset is no longer available on the NBN Gateway and can only be accessed via the BRMC's data request service. A mixture of casual field observations, systematic surveys, and short-lived surveys. The majority of records were provided by amateur naturalists who are members of the Bedfordshire Natural History Society (BNHS). Records were collated by the BNHS County Recorders for Beetles, BNHS County Recorders for Weevils, or by trusted naturalists and have received appropriate verification. The records cover the modern administrative areas of Bedfordshire (now Bedford Borough and Central Bedfordshire) and Luton, and/or VC 30. Uneven coverage of Bedfordshire and Luton largely as a result of casual recording, with some observer preference for location. Areas of the county remain unrecorded for many species. The coverage for some species is better than others where they have been the focus of surveys. Some sites, typically nature reserves, were the focus of surveys for a short while, so are recorded to a greater degree. 7,557 records have a 100m or finer grid reference resolution; 3,223 have 1km; 6 have 2km; 2 have 10km resolution. This dataset reflects several distinctive phases of recording: 1986-1993 : A concentrated period of recording of many species groups from a range of sites, many of which are nature reserves. 1990-1991, 1997-2007 : Focussed recording of Coccinellidae (Ladybirds) by a small number of observers from a range of locations. 2006-2008 : A small survey of Cerambycidae (Longhorn beetles). Records were verified by the national Cerambycidae recorder. 2009-2015 : Weevils, following appointment of County Recorder for Weevils. There are a handful of additional casual records from verified sources. Observations have been verified by County Recorders; the national Cerambycidae recorder, or are from experienced and trusted sources. Although some unintentional inaccuracies may be present, none are currently known. 10,788 records including 1,156 species. A mixture of casual field observations and systematic surveys. The vast majority of records were provided by amateur naturalists who are members of the Bedfordshire Natural History Society (BNHS), the Bedfordshire Bird Club (BBC) or the general public. A small number of records were contributed by professionals in the conservation sector. Records were collated by the BNHS/BBC County Recorder for Birds. Records for the period 2002 to 2008 were collated within the Bedfordshire Bird Club's own databases. Records from 2009 onwards were collated within BirdTrack. Records supplied through the Bedfordshire Bird Club databases (i.e. for 2002 to 2008) have been verified by the County Recorder and those preparing the annual reports. Records obtained through BirdTrack (i.e. 2009 onwards) have received automated checking to quarantine records for unusual species, excessive abundances and unseasonal reports. Of these, only records that have then been accepted by the County Recorder are present in this dataset. Due to the volume of records, now over 100,000 per year, it isn't possible to verify every record individually, so all other records are assumed to be correct. Data-entry and observer identification errors may therefore possibly be present. Location descriptions have been checked against grid references for all of the BirdTrack data and records have been omitted where there was an apparent discprepancy. Records have only been included where proper observer name(s) were supplied. Although some unintentional inaccuracies may be present, none are currently known. The records cover the modern administrative areas of Bedford Borough Council, Central Bedfordshire Council and Luton Borough Council. Coverage is uneven as a result of casual recording with observer preference for certain locations. Areas of the county may remain under-recorded for some species. The coverage for some species is better than others where they have been the focus of particular surveys, or due to observer bias towards recording certain species. Resolution of records: 10m - 10 records; 100m - 81,141 records; 1km - 362,067 records; 2km - 31,444 records; 10km - 4,005 records. Some records will have been assigned to sites using a central grid reference (rather than a containing grid reference) so these records may be overly-precise in the grid reference and will require a lenient interpretation as to the location of the sighting. Records cover the period 2002 to 2015. 478,006 records are day-accurate (DD/MM/YYYY); 402 records have a range of dates (DD/MM/YYYY-DD/MM/YYYY); 260 records are year-accurate (YYYY). 478,667 records, including 301 species. A mixture of mostly casual field observations. The records were provided by members of the Bedfordshire Natural History Society (BNHS) and members of the public. Records were collated by the BNHS County Recorder for Mammals. Bedfordshire and Luton. (Largely vice-county 30). Record grid reference resolution: 10 are 10m; 1046 are 100m; 194 are 1km; 235 are 2km; 3 are 10km. Records cover the period 1990 to 2015. 1,448 records for 1 species. Over 19,900 records are held. They cover the period 1930 to 2016. Most records have resulted from personal surveying by the National Recorders for both land and water Heteroptera. Geographical coverage is for most of Bedfordshire. Grid references for many records were assigned to a 100m site centroid. Some restrictions apply on the release of data. A mixture of casual field observations, systematic surveys and transects. The vast majority of records were provided by amateur naturalists who are members of the Bedfordshire Natural History Society (BNHS), members of Butterfly Conservation (BC) or the general public. A small number of records were contributed by professionals in the conservation sector. Records were collated by the BNHS/BC County Recorder for Butterflies. The records cover the modern administrative areas of Bedfordshire and Luton. Uneven coverage of Bedfordshire and Luton largely as a result of casual recording, with some observer preference for location. Areas of the county probably remain unrecorded for some species. The coverage for some species is better than others where they have been the focus of surveys. The transects contributed many records for a small number of locations. Most records have a 1km grid reference. Some records for rarer or colonial species have a 100m or 10m grid reference. Where locations were imprecisely reported grid references were assigned to 2km or 10km squares. Records cover the period 1976 to 2016. Most have full dates (DD/MM/YYYY) but a few only specify the year. The bulk of records date from the early 1980s, with increasing numbers over the last 20 years. Recording was intensive leading up to the Butterflies for the New Millennium Atlas (2000), and has remained high since. Observations have been verified by the County Recorder. Although some unintentional inaccuracies may be present, none are currently known. 241,773 records, including 53 species. They cover the period 1975 to 2010. Most records are just the 10km square in which the species was recorded, summarized in Bedfordshire Naturalist. Geographical coverage is for most of Bedfordshire, at the 10km level. Records have been supplied to the national recording scheme for Centipedes and are present on the NBN Gateway within its dataset. The BRMC will therefore not be uploading these records itself. They cover the period 1902 to 2010. Most of the more recent records are from point locations where monitoring ocurred. Geographical coverage is very sparce. Whiteclawed Crayfish has not been recorded in the county for several years following loss of the last known population. A mixture of casual field observations and systematic surveys. The majority of records were provided by amateur naturalists who are members of the Bedfordshire Natural History Society (BNHS). Records were collated by the BNHS County Recorder for Orthoptera. The records cover Bedfordshire and Luton (predominantly vice-county 30). Uneven coverage of Bedfordshire and Luton as a result of casual recording, with some observer preference for location. Some systematic surveying has also occurred throughout the recent decades. 2305 records have a 100m or finer grid reference; 543 are 1km; 981 are 2km; 3 are 10km. There is fairly even coverage from 1994 to 2015 inclusive. Only two records pre-date 1994. Observations have been verified by the County Recorder for Orthoptera. Although some unintentional inaccuracies may be present, none are currently known. 3,832 records, including 19 species. BRMC data for Orthoptera on NBN Atlas. A mixture of casual field observations and systematic surveys. The majority of records were provided by amateur naturalists who are members of the Bedfordshire Natural History Society (BNHS). Records were collated by the then BNHS County Recorder for Orthoptera, Derek (D.G.) Rands. This digital dataset was created by the BRMC (the data provider) by digitizing paper records passed to it from the estate of Beryl (E.B.R.) Rands. Records cover the range 1975 to 1990. Observations were verified by the County Recorder for Orthoptera. Although some unintentional inaccuracies may be present, none are currently known. 1,445 records, including 12 species. They cover the period 1908 to 2016, with one record for 1838. Resolution varies, but most records are 100m to 2km resolution. Geographical coverage is for most of Bedfordshire with some observer preference for location. Records were collated and verified by the Bedfordshire Recorder for Dragonflies and supplied to the British Dragonfly Society from which the BRMC obtained them. They have been (or will be) uploaded to the NBN Gateway by the BDS, so will not be uploaded by the BRMC. A mixture of casual field observations, systematic surveys and monitoring. The majority of records were provided by members of the public and by amateur naturalists who are members of the Bedfordshire Natural History Society (BNHS), but there are also some monitoring records by Environment Agency/National Rivers Authority and a few records by Anglian Water. Records were collated by the BNHS County Recorders for Fish. Uneven coverage of Bedfordshire and Luton largely as a result of casual recording. Some locations on the major rivers have been monitored by agencies and some of their records are contained within. 4,004 records have a 100m or finer grid reference; 173 have 1km; 799 have 2km; 71 have 10km. Records cover the period 1840 to 2016. There are six records from the nineteenth century and nine twentieth century records from before 1976. The vast bulk of the datasets covers the period 1976 to 2015. 72% of records are year only (YYYY) the remainder mostly being day-accurate (DD/MM/YYYY). Observations were verified by the BNHS County Recorders. Some unintentional inaccuracies may be present, though none are currently known. 5,047 records, including 33 species. Hymenoptera (Aculeata and Symphyta) within Bedfordshire and Luton. (There are no records of Parasitica within this dataset). A mixture of casual field observations, systematic surveys, and single-site studies. The majority of records (48%) within this dataset are life-time 10km square species-lists produced by the late Victor H. Chambers for Wasps and Ants, published in Bedfordshire Naturalist No.39 (1984). (Regrettably no similar summary for bees or sawflies was published). These records cover the period 1930 to 1984 and simply record the presence of a species at some point during this period. (In some cases the possible year range is reduced to be 1930-1960, or 1960-1984). (Bedfordshire Naturalist is the Journal of the Bedfordshire Natural History Society (BNHS)). There are also some species lists for Aculeata and Symphyta recorded by Vic Chambers on a small number of sites, extracted from the Invertebrate Site Register or published in the Bedfordshire Naturalist No.s 1, 2, 3 and 6. The grid references for these are typically tetrads (2km squares). These make up approximately 45% of the dataset. In addition there are 155 records from a small number of sites by a small number of specialist recorders. Many of these were supplied to the Wildlife Trust as records from their reserves. Bumblebees are now actively recorded in the county and data collated by the current County Recorder for Bumblebees as a separate dataset. The records cover the modern administrative areas of Bedfordshire (now Bedford Borough and Central Bedfordshire) and Luton, and/or Vice County 30. The life-time summary for Wasps and Ants reflects systematic recording of the county over many decades and should be a fair representation of species distribution within this period. Coverage for bees and sawflies is very sparse, with records of a small number of species from a small number of sites. Since the death of Vic Chambers, recording of Hymenoptera in the county has been very limited and patchy. Recent records have come from only a few sites. Approx 50% of records have a 10km grid reference, 43% have a 2km grid reference, 3% have a 1km grid reference and 3% a 100m grid reference. This dataset reflects distinctive phases of recording: 93% of records have wide data ranges within the period 1930 to 1984, but in some cases the range is either 1930-1960 or 1960-1984. Sometimes records from specific sites extracted from the Invertebrate Site Register have more limited ranges, but within the same overall period. Observations were verified by Vic Chambers (many are his own observations), or by visiting County Recorders from other counties, or by a small number of trusted sources. Although some unintentional inaccuracies may be present, none are currently known. For Victor H. Chambera's records no more information is currently to hand though some of his notebooks may be at the Natural History Museum, and he did publish throughout his life in several learned journals, which a literature search will reveal. 4,506 records, including 768 species. A mixture of casual field observations and transects. The records were provided by members of the public and by amateur naturalists who are members of the Bedfordshire Natural History Society (BNHS). Records were collated by the BNHS County Recorders for Bumblebees. The records cover the modern administrative areas of Bedfordshire and Luton. Uneven coverage of Bedfordshire and Luton largely as a result of casual recording. 10,328 records have a 100m or finer grid reference; 149 have 1km; 6 have 2km resolution. Records cover the period 1986 to 2016. The records are day-accurate (DD/MM/YYYY). 10,483 records, including 16 species. A mixture of casual field observations and systematic surveys. The majority of records were provided by amateur naturalists who are members of the Bedfordshire Natural History Society (BNHS). 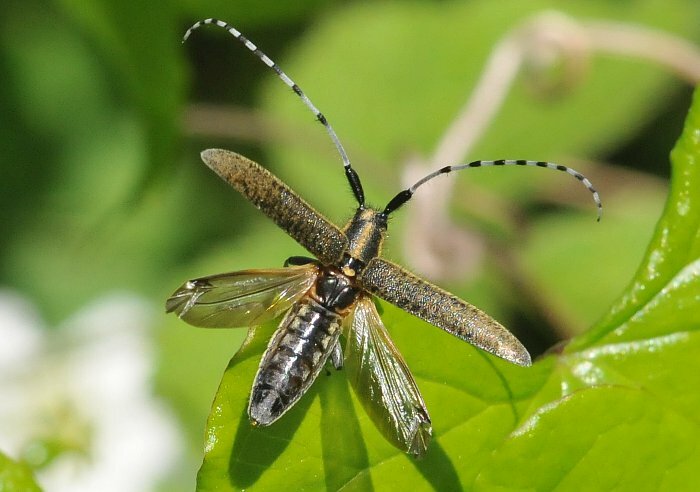 Records were collated by the BNHS County Recorders for Neuroptera and their Allies, who also did much of the recording. The records cover the modern administrative areas of Bedfordshire (now Bedford Borough and Central Bedfordshire) and Luton, and/or VC 30. Uneven coverage of Bedfordshire and Luton largely as a result of casual recording, with some observer preference for location. Areas of the county remain unrecorded. Approx 55% of records have a 100m grid reference or finer; 10% are 1km; 6% are 2km and 29% are 10km. This dataset reflects different phases of recording: 1943-1995 : Lists of species recorded over this period published as 10km square summaries in Bedfordshire Naturalist 45. These records each carry the date range 1943-1995. These comprise 21% of the dataset. 1942-1999 : Records extracted from copies of Bedfordshire Naturalist published over this period and assigned grid references of various resolutions according to the information available. These are mostly day-accurate or a range of days within a year. These comprise 58% of the dataset. 1999-2009 : Records collated by the current County Recorder. These are almost entirely day-accurate. These comprise 21% of the dataset. Observations have been verified by successive County Recorders. Although some unintentional inaccuracies may be present, none are currently known. 624 records, including 45 species. Over 1870 records are held. They cover the period 1977 to 2010. Most records are 100m resolution. Geographical coverage is from much of the county with a particular focus on churchyards. Records were collated and verified by the Bedfordshire County Recorder for Lichens. They have been (or will be) uploaded to the NBN Gateway by the British Lichen Society so will not be uploaded by the BRMC. Most records have been obtained through systematic surveying and monitoring of known or previously-known Dormouse sites by the Bedfordshire Dormouse Group (BDG) which is affiliated to the Bedfordshire Natural History Society (BNHS). Some records have also been the result of chance observations by naturalists or members of the public. Records were collated by the BNHS County Recorder for Mammals and the Bedfordshire Dormouse Group. Bedfordshire and Luton. The clustered nature of the records reflects the known distribution of Dormice populations within the county and includes one introduction programme. Other sites that have been monitored and not found to contain an extant population are not included in this dataset. 316 records have a 100m grid reference; 15 have 1km; 4 have 2km; 9 have 10km. Records cover the period 2000 to 2015. 323 have full dates (DD/MM/YYYY), nine are year-only (YYYY) and one is a range of months (MM/YYYY-MM/YYYY). Observations were verified by the County Recorder for Mammals. Not all verified observations reported during the dataset's period may yet be present in this dataset and some unintentional inaccuracies may be present, though none are currently known. 344 records for 1 species. Mammal species records, excluding Bats, Badger, Hazel Dormouse and Brown Hare. (Records for Hazel Dormouse and Brown Hare are maintained as separate datasets. A mixture of casual field observations and systematic surveys. The records were provided by Bedfordshire Natural History Society (BNHS) members and other members of the public. Additionally there has been systematic surveying for Otters by the Bedfordshire Otters and Rivers Project (BORP). Systematic surveying for Water Voles has also occurred. Records were collated by the BNHS County Recorder for Mammals. Uneven coverage of Bedfordshire and Luton largely as a result of casual recording, with some observer preference for location. Areas of the county probably remain unrecorded for certain species. The coverage for some species is better than others as some have been the focus of surveys. 11,060 records have 100m or finer resolution; 1,873 are 1km; 1,940 are 2km; 8 are 10km. Records mostly cover the period 1987 to 2017. Observations were verified by the County Recorder. Not all verified observations reported during the dataset's period may yet be present in this dataset and some unintentional inaccuracies may be present, though none are currently known. 13,519 records, including 38 species. A systematic survey of the tetrads of the county over the period 1975-1979 followed by a period of less-intensive recording to 1985. The majority of records were provided by amateur naturalists who are members of the Bedfordshire Natural History Society (BNHS). Records were collated by the BNHS County Recorder for Isopoda, Chilopoda and Diplopoda, who also undertook much of the survey work. The records cover the modern administrative areas of Bedfordshire (now Bedford Borough and Central Bedfordshire) and Luton, and/or Vice County 30. (It is currently unclear which boundaries limited the survey area). As the tetrads were systematically surveyed coverage of the county should be relatively good. Published summary maps to 1979 show at least one species recorded in nearly every tetrad (with six or more species from some tetrads). The records within this dataset are only the 10km square summary that was published in Bedfordshire Naturalist No.34 (for the year 1979) and the subsequent follow-up in Bedfordshire Naturalist No.39 (for the year 1984). One additional record was added in Bedfordshire Naturalist No.40 for 1985. The individual tetrad records are unfortunately not currently to-hand (to the BRMC). Seven records (for 1981 to 1985) carry 100m grid references. All others are 10km square species-list summaries. Six records are day-accurate (in the year range 1981-1983), the others are ascribed to a range of years, mostly 1975-1979, but with a few for 1980-1984 and one for 1985. Observations have been verified by the County Recorder who also undertook much of the surveying. Although some unintentional inaccuracies may be present, none are currently known. 401 records, including 32 species. BRMC data for Diploda on NBN Atlas. Mollusca (Snails and slugs). Due to their sensitivity this dataset does not include records of the Roman Snail, Helix (Helix) pomatia, but does include all other recorded species. This digital dataset was created by the BRMC (the data provider) by digitizing record cards passed to it from the estate of Beryl (E.B.) Rands. Systematic fieldwork that covered all tetrads to some degree. The majority of records were provided by amateur naturalists who are members of the Bedfordshire Natural History Society (BNHS). Records were collated by the then BNHS County Recorder for Mollusca, Beryl (E.B.) Rands. The records cover the eastern and central (vertical) portions of Bedfordshire and Luton (i.e TL02-TL07, TL11-TL16 & TL23-TL25), predominantly vice-county 30. 12,695 records have a 100m grid reference; 4,430 have 1km; 614 have 2km, 202 have 10km. Records cover the period 1940 to 2016. Most records cover the period 1962 until the mid-1980s. Observations were verified by the then County Recorder for Mollusca. Some specimens were also determined by national experts. Digitization queries have also been resolved with the assistance of the current County Mollusc Recorder. Although some unintentional inaccuracies may be present, none are currently known. 17,941 records, including 177 species. BRMC data for Mollusca (Non-sensitive) on NBN Atlas. This dataset contains only species that are considered to be sensitive, currently just the Roman Snail, Helix (Helix) pomatia. This digital dataset was created by the BRMC (the data provider) by digitizing record cards passed to it from the estate of Beryl (E.B.) Rands. Funding has so far allowed only records from the eastern portion of the county to be digitized. It is hoped to be able to digitize the cards for the remainder of the county when resources permit. The records cover the eastern portion of Bedfordshire and Luton (i.e TL11-TL16 & TL23-TL25), predominantly vice-county 30. 3 records have a 100m grid reference; 5 have 1km. Records cover the range 1946 to 2017. 17 records, including 1 species. BRMC data for Mollusca (Sensitive) on NBN Atlas. This dataset contains the 50 millionth record to be loaded onto the NBN Gateway! A mixture of casual field observations and systematic surveys. The majority of records were provided by amateur naturalists who are members of the Bedfordshire Natural History Society (BNHS). The records cover Vice County 30 (Bedfordshire). Uneven coverage of Bedfordshire and Luton as a result of casual recording, with some observer preference for location. Some systematic surveying has also occurred throughout the recent decades, with high concentrations where light traps are operated. 477,561 records have 100m or better resolution; 63,879 have 1km; 17,679 have 2km; 815 have 10km. The records cover the period 1780 to 2017. 97.5% of the records derive from 1973 to 2017. Observations have been verified by the BNHS County Recorder. Although some unintentional inaccuracies may be present, none are currently known. 559,934 records, including 1,582 species. They cover the period 1900 to 2016. Geographical coverage is from much of Bedfordshire but there are probably more records for the southern half of the county. Resolution varies, but most records are 100m resolution. The records were collated and verified by the British Arachnid Society/Spider Recording Scheme's Recorder. These records were obtained from BAS/SRS and have been (or will be) uploaded to the NBN Gateway by them, so will not be uploaded by the BRMC. Collation of known information about Stylops in Bedfordshire. Analysis of museum collections, personal collections and field work. The records cover Bedfordshire and Luton (predominantly vice-county 30). Records were published in 1974 without grid references. Tentative grid references have been assigned using the published information and local knowledge and should only be considered as indicative of the general location. Records are derived from material dating mostly from 1930 to 1945. Four are from 1971. Uncertain, but data were published in the journal of the Bedfordshire Natural History Society in 1974 and were accepted at the time. Eight species were reported in the journal but many appear to have since been synonymized to the three contained within this dataset. The comment field in the records contains the originally-published species names. The data have been extracted from The Bedfordshire Naturalist (No. 29, for 1974), being the Journal of the Bedfordshire Natural History Society. The article by Bruce Ing entitled Stylops in Bedfordshire can be found on pages 53-55. 33 records, including 5 species. BRMC data for Stylops on NBN Atlas. A mixture of casual field observations and systematic surveys. The records were provided by members of the Bedfordshire Natural History Society (BNHS) whose Flora Group has systematically surveyed the county. Records have also been acquired from site surveying and monitoring by conservation organizations. The dataset also contains records from a county-wide Phase 1 survey in 1988-1989. Records were collated by the County Recorder for vascular plants, ferns and fern allies on behalf of the BNHS and the Botanical Society of the British Isles. The records cover both the modern administrative areas of Bedfordshire and Luton and Vice-County 30. Due to systematic surveying of the county by the Flora Group geographical coverage is high, with all tetrads having been surveyed. Many records have tetrad resolution, but uncommon species have often been recorded more precisely, to 100m or 10m resolution. Many County Wildlife Sites have been surveyed and monitored contributing further records for these sites. Other naturalists have also contributed records from casual recording, with some observer preference for location. Records cover the period 1904 to 2017 however only 119 records are from before 1976 which is the start year of the bulk of the data. Most have full dates (DD/MM/YYYY) but a few only specify the year. The most intensive recording occurred during the period 1987 to 2004 as a result of the work by the Flora Group and the phase 1 survey. 375,290 records, including 1,749 species. The records cover the modern administrative areas of Bedfordshire (now Bedford Borough and Central Bedfordshire) and Luton, and/or Vice County 30. (It is currently unclear which boundaries limited the survey area). As the tetrads were systematically surveyed coverage of the county should be relatively good. Published summary maps to 1979 show six or more species recorded from most tetrads. The records within this dataset are only the 10km square summary that was published in Bedfordshire Naturalist No.34 (for the year 1979) and the subsequent follow-up in Bedfordshire Naturalist No.39 (for the year 1984). (No additional records were added in 1985). The individual tetrad records are unfortunately not currently to-hand (to the BRMC). Three records (for 1981 to 1982) carry 100m grid references. All others are 10km square species-list summaries. Three records are day-accurate (in the year range 1981 to 1982), the others are ascribed to a range of years, mostly 1975-1979, but with a few for 1980-1984. 243 records, including 21 species. BRMC data for Isopoda on NBN Atlas.